W. H. Auden is a giant of twentieth-century English poetry whose writings demonstrate a sustained engagement with the times in which he lived. But how did the century's shifting cultural terrain affect him and his work? 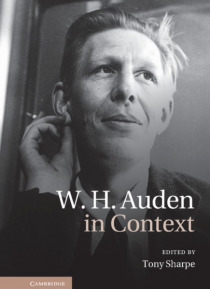 Written by distinguished poets and scholars, these brief but authoritative essays offer a varied set of coordinates by which to chart Auden's continuously evolving career, examinin… g key aspects of his environmental, cultural, political and creative contexts. Reaching beyond mere biography, these essays present Auden as the product of ongoing negotiations between himself, his time and posterity, exploring the enduring power of his poetry to unsettle and provoke. The collection will prove valuable for scholars, researchers and students of English literature, cultural studies and creative writing.